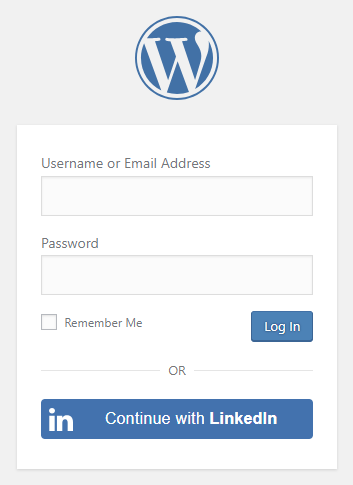 To be able to log in via Linkedin you must create a Linkedin app first. Locate the yellow “Create application” button and click on it. Once your Linkedin app is ready you’ll need to copy and paste the Client ID and Client Secret to the Linkedin provider’s Settings tab. You can find the information at your Linkedin app’s Settings which you can reach from the left sidebar. The Client ID of your Linkedin app. You can find it at your App under Authentication Keys. The Client Secret of your Linkedin app. You can find it at your App under Authentication Keys. Whenever a new user registers with their LinkedIn account they can get a custom prefix so you can easily identify them. Whenever a new user registers with their LinkedIn account and we can not generate a valid username from the first name or last name, a random username will be generated. With this option they can get a custom prefix so you can easily identify them. This option can only be seen, if Terms and conditions is set to Show in Global Settings → Privacy tab. Here you can set custom Terms and Conditions for users who register with LinkedIn. For more information please read our GDPR documentation. With additional scopes the Email Address of the user can also be retrieved. 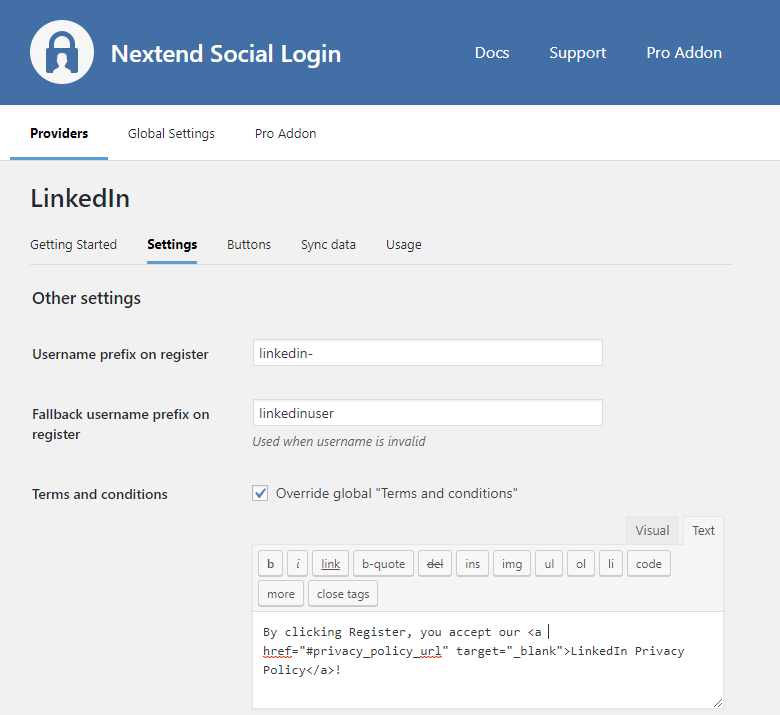 Since the sync data fields we had in Nextend Social Login v3.0.18 and before are no longer available in the v2/me REST API Endpoint, we need to remove the whole sync data feature of the LinkedIn provider. The problem is that the entered Authorized redirect URLs field is not correct for your app. Check the 8th step of the App setup to fix the problem. The entered Client ID is not correct. Maybe the app with the entered ID was deleted. 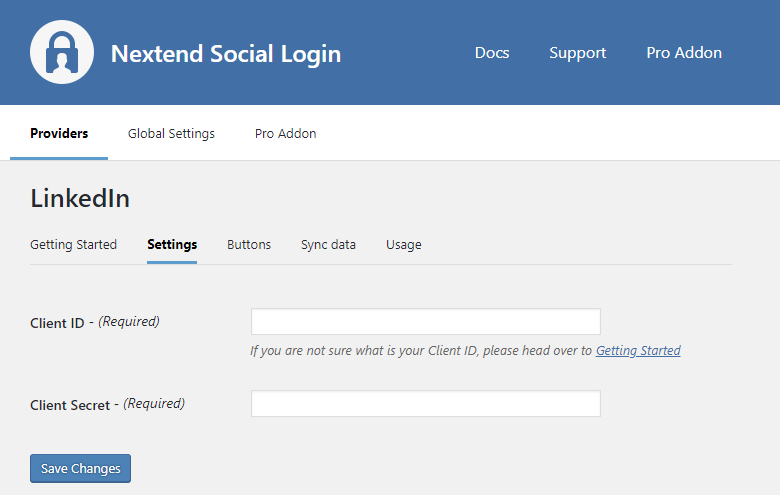 Go to the LinkedIn provider → Settings and make sure that an existing App’s Client ID and Client Secret was entered. The Client Secret you copied from the LinkedIn app is invalid. Make sure the correct one was copied.